Thankfully, the ding of a text interrupted my useless inner monologue, a birding friend in the Bronx asking if I was chasing, and a plan instantly formed. Thank you, Richard! I grabbed car keys, bins, camera (yeah, I’d have to make do without the longer lens), an apple, swished down the rest of my coffee, drove up to the Bronx to pick up Richard, and we were on our way. Cedar Beach Marina is located on one of Long Island’s barrier beaches, in Suffolk County. You drive towards Jones Beach then hang a left down Ocean Parkway, ignoring the birder sitting next to you pointing out a possible Merlin and newly arrived Brant because you need to drive at just the right speed. State police can be zealous around here. Parking is a challenge. The advice given on the listserv was to park in a nearby parking lot and walk over down the road, but as I started to pull in, I saw cars up ahead, parked on the median, pull out. Had something happened? Had the bird moved to a different area? Maybe it was eaten by that Merlin? Or by a cat! I drove up to where now only two cars were parked, and saw Steve and Isaac, two New York birding friends, stood in the middle of the median. The bird was right there, they said, pointing vaguely north. Where? I looked around, wishing my head could spin around 360 degrees. I often feel that way when I’m on a twitch. Oh, it just walked inside the bushes, they tell me. I still wasn’t sure which bushes they meant. It turns out that the crake had been feeding all morning along the westward part of Ocean Parkway, and birders discovered that the best place to observe it, being skittish to human presence, was from the wide, poison ivy infested median separating the eastward and westward lanes. It would walk and feed amongst the tall grass, then disappear, then appear again, its cryptic coloring making it seem like it came out of nowhere. And, so it did because all of a sudden there in front of me, across the median, across the road was a Corn Crake! In New York State! The bird was much larger than I expected, both in size and in structure; Richard and I agreed that it appeared more gallinaceous than rail-ish. Its buffy face and chest identified it as an immature bird (thank you, 7th edition of the National Geographic Guide to Birds of North America, soon to be reviewed here). And, the feathers! Look at that beautiful design along the back and along the top of the head! Close-ups show that the design comes from dark feathers outlined broadly in buffy yellow. I took a short video of the Corn Crake as it deliberately walked and poked and poked and walked. Later, as more birders gathered, many friends from Queens, Long Island and Staten Island, I caught the Crake with a worm. Many birders had dragged their scopes and tripods through the brambly scrub, but I could see it quite well with my binoculars. And, I only missed the longer lens for a few minutes. I never dreamed I would be so close for so long a time to a Corn Crake. 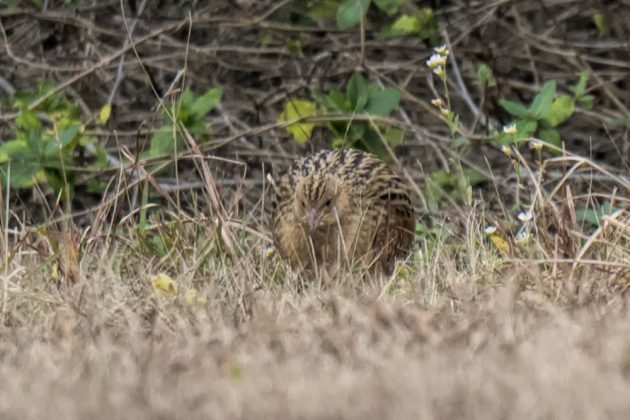 I was surprised to read that Corn Crakes are not marsh birds. They are found in meadows and other grasslands, habitats which have been attributed as a major reason for their steep decline in Great Britain and Europe. However, there appears to have been an upward change in their population, at least in Scotland, where a recent RSPB survey found that a cooperative conservation program has increased the population there from 400 singing males in the early 1990s to 1,289 calling males in 2014. 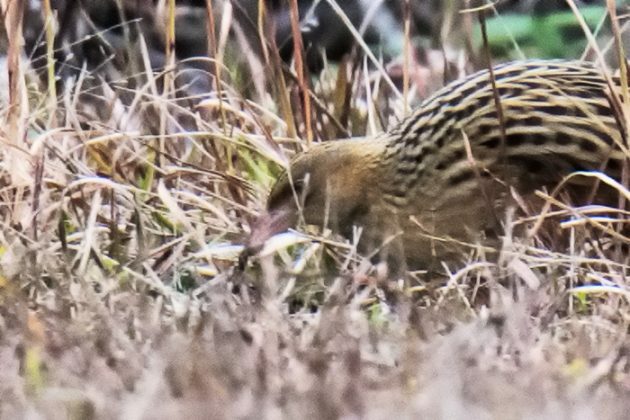 There has been some discussion about the history of Corn Crakes in North America, and I expect there will be more if the bird sticks. 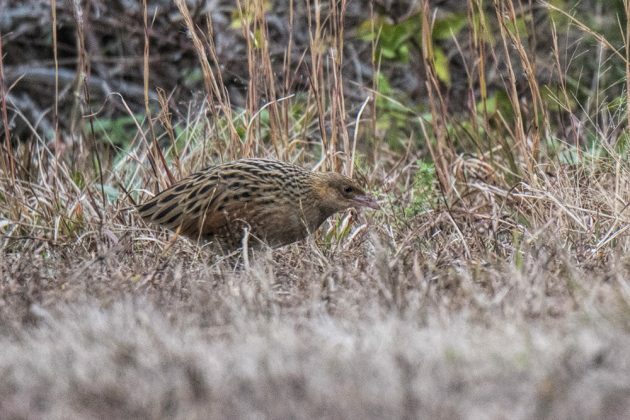 The last sighting in New York State was November 2, 1963 in Orient, Suffolk County, where the Crake was shot in a field of rye (Bull’s Birds of New York State, 2002). More recently, in January 2016, a Corn Crake was found in the jaws of a cat in Pennsylvania; it died from its injuries. In Rare Birds of North America (PUP, 2014), Steven N.G. Howell and his co-authors theorize that Corn Crake “is making regular landfall in e.N America but going undetected.” Their reasoning is based on records from Canada and Bermuda in which the bird was found either dead in the road or in the claws or jaws of cats. No wonder–our Corn Crake seemed oblivious to the cars speeding past it. Hopefully, its reaction to any feral cats in the area will be the same as its reactions to birders–run! 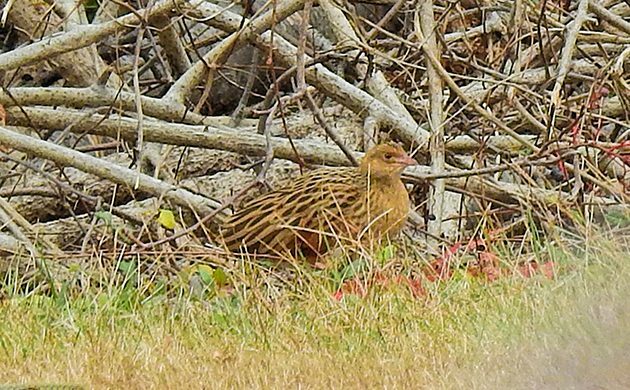 Was the Corn Crake seen today, Wednesday November 8th? Yes it was, all day, in the same spot. A bird more likely to be heard than seen even in Europe! Clare–I know, crazy right? For some reason that happens. I’ve had much better views of European Goldfinch and Hooded Gull in the States than in their native habitats. Sadly, the Corn Crake was found dead this morning (Nov. 9th). The many birders there report that it had a broken leg. The specimen was collected and is on its way to the American Museum of Natural History. We are all really sad. This bird brightened our lives for two days. Pretty amazing considering I’ve heard it probably more than 1,000 times here in Germany but only seen if in flight in the corner of my eye for a fraction of a second once. So yes, Clare’s comment is indeed spot-on. Sorry to read it is dead, of course.